Good morning!! It's been a doozy of a morning for me, because Blogger has decided that it won't upload any of my pictures. FINALLY I got my picture to load, but I'm still not able to upload through Blogger. I uploaded to Photobucket, then added that link into the photo upload process on Blogger. Whew!! I'm learning things I really don't care to know, but I guess it's good to learn all the ways around a particular problem. I hope whatever this is with Blogger isn't going to affect my uploads like this all the time, or I may pull my hair out!!! 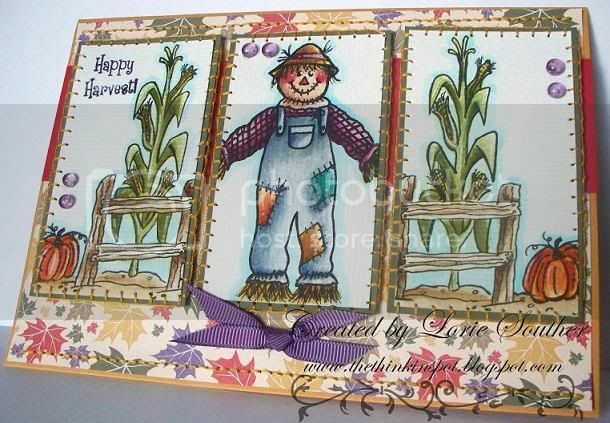 On a happy note, this card is made with Sweet -n Sassy Stamps Happy Harvest set. Sweet-n Sassy is sponsoring the CPS challenge today, which is yet another fabulous sketch. Check out the links to all the Design Team girls participating. There's some amazing talent on this team, and you're gonna love what they have to share!! Ceal, Chris, Korin, Nancy, Courtney, Teresa, Jeanette, and Janette, always have fabulous creations for inspiration. I added some hand stitching to the edges of the card, and I did a blanket stitch around each of the images. I find that so relaxing to sit down and do while I'm watching TV. It's very therapeutic. The DP is from Stampin' Up!, and I added some dew drops and grosgrain ribbon for embellishments on this 5x7 card. I think I was technically supposed to do a Christmas themed card with one of Sweet -n Sassy Stamps new releases, You Light Up My Life, and Waddle I Do?, but I guess I was so excited to ink up this Fall set that I'd received that it slipped my mind. Oh well, my intentions were good!! I'd love to give a shout out to our very sweet Design Team Coordinator, Sandy Domelle, and wish her a happy birthday! May you have a glorious day, Sandy!! I truly thank you for stopping by today. I hope you have been inspired by what you've seen, and I look forward to your next visit! May you have a blessed day! Lorie, this is amazing! The coloring is gorgeous and all that stitching!! I know what you mean about hand-stitching being theraputic, but, girl, all this would put me IN therapy! Your stitches are absolutely perfect! Beautiful! This card is absolutely breath taking, jaw dropping gorgeous. I just LOVE your coloring. Wish I could learn to color like that. I was so blown away by the coloring on this card that I forgot to mention the gorgeous HAND stitching. Adorable card. Your coloring is wonderful! I'm so glad you figured out a way around the technical issues and got this beautiful card posted! I read on someone else's blog that they were having the same problem, so it wasn't you! Lorie, I am so sorry to hear that you had such trouble getting this posted. I hope the issues are ironed out soon. But I'm so thankful you found a way to post this gorgeous card! It is just amazing! I love how you spread the harvest scene across the three panels, and WOW on the stitching!!! Hya Lorie! Just stopped by for a nosey and look what I found!! ANOTHER Lorie special!! This is amazing. LOVE the colouring, (what's not to love) and that stitching, WOW. All teamed up with that oh so pretty DP. You are SO talented.